The 83 metre Amels flagship superyacht Here Comes The Sun has been delivered to her owner, with the Dutch yard releasing a short video to mark the occasion. First splashed on June 30, 2016, the new Amels flagship features interiors by Winch Design, while the graceful, feminine exterior styling is courtesy of Tim Heywood. The latest footage shows her being towed through a lock before setting off on her maiden voyage. Speaking at the launch ceremony, the owner's representative Yavor Nenov, said, "She’s very impressive and I think she’s a credit to the yard and all the hundreds of craftsmen working on her.” Rob Luijendijk, managing director of Amels, added that the client is a former Amels owner who wanted to make the step up to a larger displacement yacht. 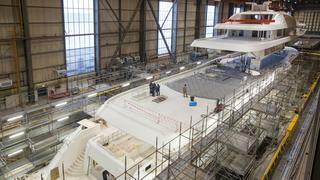 Her 14.54 metre beam and six decks allow for a total interior volume of 2,827GT. Accommodation includes eight guest cabins and room for a crew of 27. 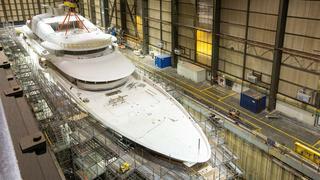 Amels first released photos of its new flagship 83 metre superyacht, in build and with the steel hull looking all but complete, in February 2015. Speaking last year, designer Tim Heywood explained his approach to the project, saying: "Amels were interested in building a larger boat. They wanted to make more of those features they feel their boats have always portrayed — the big open spaces, big deck areas." The exterior lines of Here Comes The Sun have been kept sleek and racy despite the vessel’s size, and there are plenty of modern touches to create a thoroughly contemporary feel, mixed with the traditional seamanlike approach that Amels is known for. The scale of the yacht has made it possible to create some enviable living spaces, including a 42 metre long, 300 square metre owner’s deck. This has promoted the seven large guest cabins to the main deck from the traditional lower deck location — giving guests more daylight through this level’s large windows and easy access to the 5.5 metre long main deck superyacht pool. Here Comes The Sun also features an airy 87 square metre beach club with a spa and fold-down terraces aft and starboard, a water toy store that can accommodate two 11 metre tenders and four jet skis, and 900 square metres of outside deck space that Heywood describes as “grand conversation spaces and comfortable, well-serviced dining areas”. Power comes from a pair of 3,150hp Caterpillar engines for a top speed of 17 knots. When cruising at 15 knots, she will have a maximum cruising range of 5,500 nautical miles.